The Carolina Hurricanes have eradicated at least one phrase from their vocabulary. “We did not start on time” has yet to be heard in a post-game locker room interview with players, from head coach Rod Brind’Amour at a press conference. What had been a staple statement during the four years that former head coach Bill Peters was at the helm has suddenly disappeared. Brind’Amour’s team, of mostly young aspiring players who are full of talent, is not dragging itself onto the ice. They are not playing with the half-hearted effort that characterized Peters’ teams. They are not lamenting that they did not start on time. 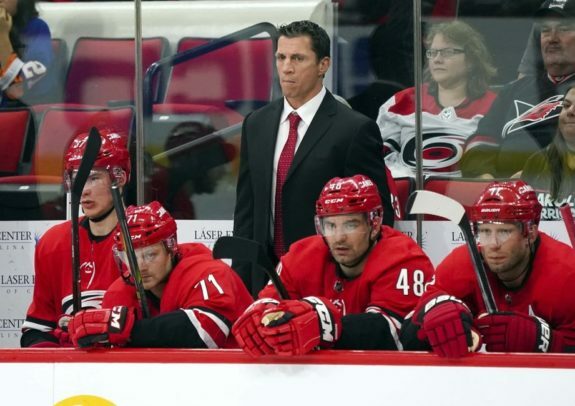 Brind’Amour is known for his passion and for challenging himself to raise the bar, go higher and dig deeper. He’s as a beast when it comes to fitness and even as a coach he is still getting after it every day. In fact, he did the same preseason testing and preparation as every other member of the Hurricanes and his scores indicated that he is still good enough to fill a mid-level roster spot. 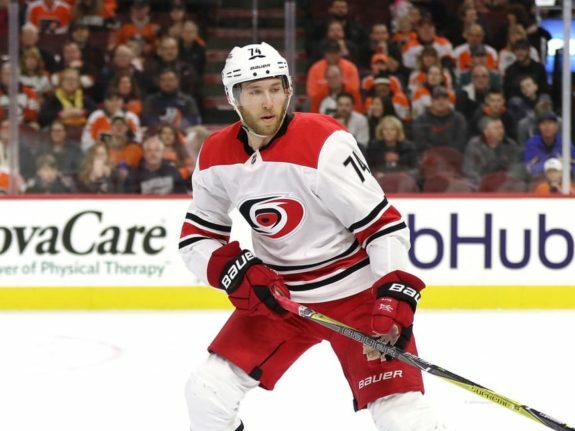 His dedication seems contagious like a virus has spread through the locker room, at least for the Hurricanes’ first four games. The team is hungry and so far, in this young season, is passionate and energized. Brind’Amour has them starting and finishing on time. While there were volumes written during Peters’ tenure about the inexplicable phenomenon of professional athletes saying, “We didn’t start on time,” that topic will likely not come up where these Hurricanes are concerned. Granted, there may be the odd game during an 82-game schedule when fatigue or frustration sets in and causes a lapse in energy. But, don’t bet on it. Part of the difference between Peters and Brind’Amour is that Peters is a tough, old-school hockey guy. While there is nothing wrong with that, Brind’Amour is younger and willing to relate to the players at their level. They also use different styles of play. Peters was insistent on playing proper positional hockey. Brind’Amour recognizes he has a lot of young players who are learning. He is willing to trade mistakes for letting them play to their talent. So far it’s working and perhaps more importantly, it’s a lot of fun to watch. But don’t think for a minute that Brind’Amour doesn’t see those mistakes and areas that need work. He won the Frank J. Selke Trophy two years in a row as the league’s best defensive forward. He understands the game and is not going to allow his players to be sloppy and carefree without instructing and correcting them. He told me after their 8-5 victory over the New York Rangers that, “The beautiful thing about a game like this is you can work on mistakes and feel good about it because you found a way to win. Whether we had won or lost I don’t think it would change what we’d be working on, but the way we think about it would probably be different.” Brind’Amour knows what needs to be tightened up, and his challenge is to work on those areas without reining in the enthusiasm or the effort that is burning hot through his team. The Hurricanes have been playing a chaotic brand of hockey. Yes, it is fun for the fans and the players but honestly, they have only won against teams that are not considered playoff contenders. An overtime loss to a rebuilding New York Islanders team is nothing to brag too loudly about. Scoring eight goals against a rebuilding Rangers team is fine, but is anyone concerned that they gave up five goals in the process? Similarly, a 5-3 victory over the Vancouver Canucks is well and good, but allowing three goals also might be cause for concern. The 2-1 victory over the Columbus Blue Jackets on their ice was a legitimately good win for the ‘Canes. A couple of weeks ago a colleague in the press box said that the team’s high-scoring games might cover up the less-than-stellar play the Hurricanes have in nets. They have the talent to score a lot of goals. As they head out on their annual road trip, necessitated by the North Carolina State Fair, the Hurricanes will take on the Minnesota Wild, the Winnipeg Jets and then head to Florida to face the Tampa Bay Lightning. They will be seriously tested. The question is will this chaotic brand of hockey be successful against legitimately playoff contending teams? Fans can only hope that the answer is yes and that they will play it all the way into a deep playoff run.